Hi there peeps, I have been very busy and wanted to have this tutorial up earlier for you, but diggin’ all that product out for my Catch Up Post’s, I soon realized I could do with a spring clean/reorganization in my craft room mmmm, it turned into mega spring clean/reorganization in winter, so come spring (while everyone else is spring cleaning….. you guessed it, I can craft away woo hooo! I also had a bad tooth (all fixed now), and I built some canary box’s and shelves for my Brother in-law’s bird room, I also had my eyes tested (yep new glasses coming). So finally here it is, I hope you have loads of fun with this technique. I called it Dry Embossed “Faux Tile” Technique. It is a follow on from my previous tutorial Here. Photo’s don’t do this justice, but I am sure you will enjoy this as much as my first tutorial. I made 2 card designs again!, just for fun. 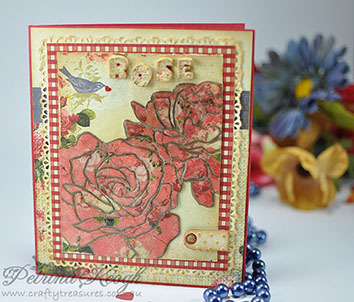 There is a link below for 2nd card tutorial (or just access tutorials from the top menu). 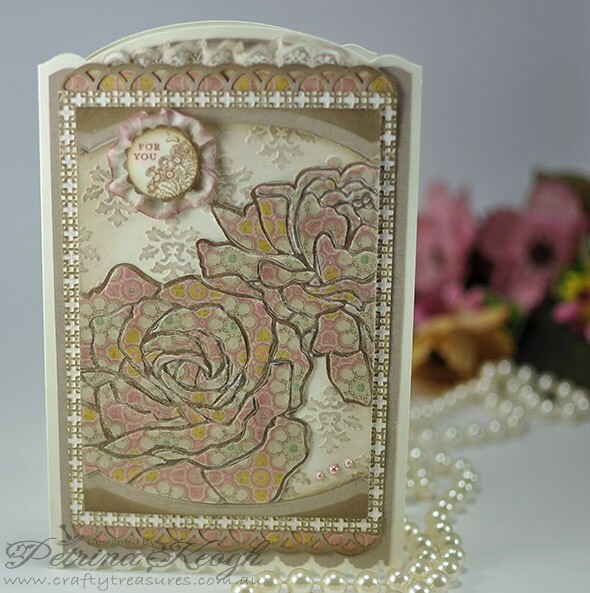 I opted for a shaped card using Stampin’ Up! – Edgelits/Adorning Accents, I used each design… top and bottom. I coloured the seam binding with Copic Markers (the Copics do stiffen the seam binding, when it dries). The first 2 layers were cut with SU- Edgelits/Adorning Accents. 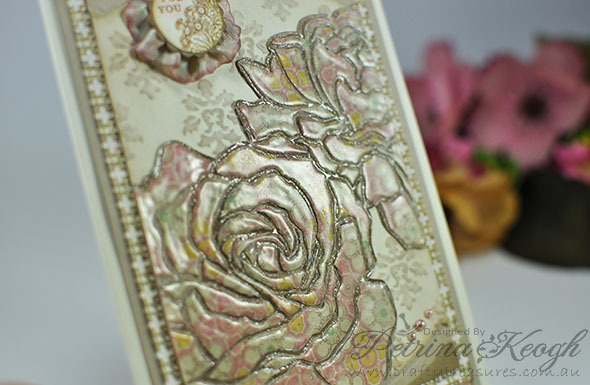 The 3rd layer was embossed with SU – Edgelits/Adorning Accents. 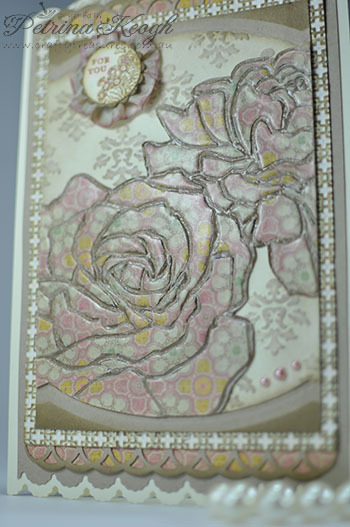 The 4th layer was embossed with SU – Square Lattice, and the 5th layer was punched with Martha Stewart – Edge Punch/Layered Arches. Here is the second card and the tutorial for this technique. 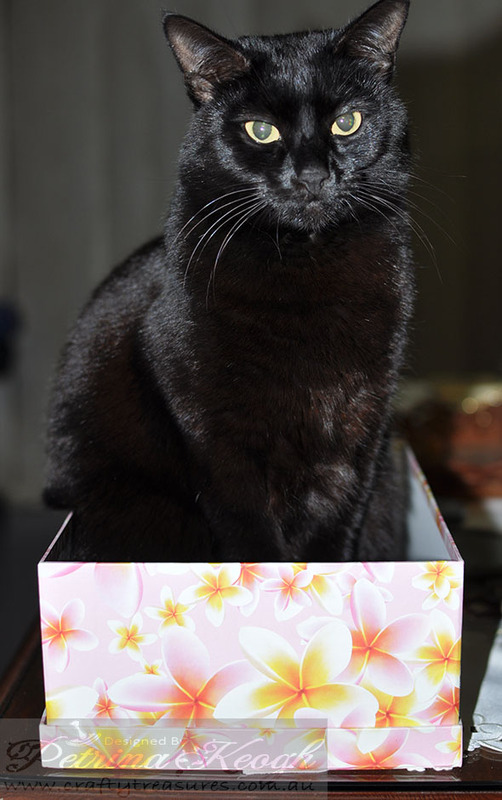 Here are some shots of our puss named Shadow (everywhere I go, she is my shadow!) 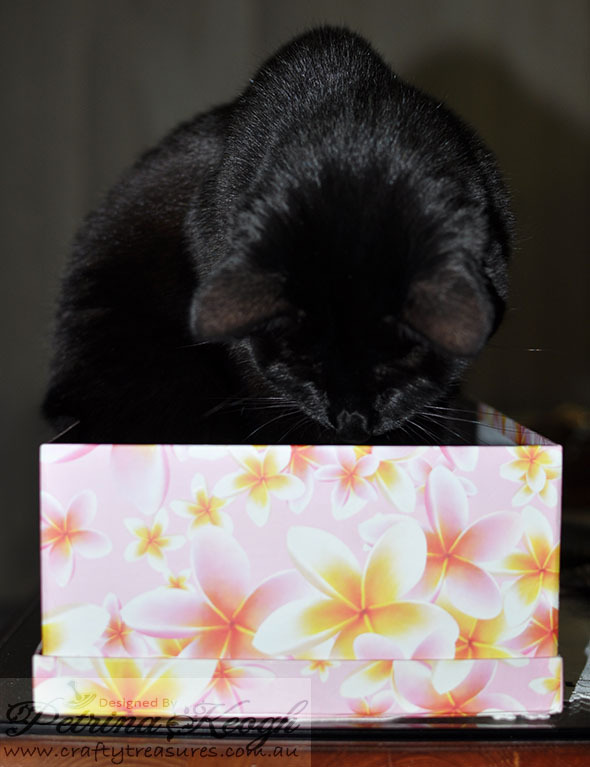 I had this box with my projects in to list all the product for the last post, lucky I took the cards out of the box, cause Shadow hopped in! She looks so serious in this shot ‘Pffft’, this is her “Are you for real, I am not impressed” pose!